My mother emailed to tell me that my aunt had been to the Maine Quilt Show today. She said she knew something about my quilts. I kind of figured that meant that they probably had a ribbon. I asked her to elaborate. And all I know now is that there are 2 ribbons...one for this quilt and this one. Right now I could wring her neck for not telling me more, knowing I cannot go to see the quilts until mid-day Sunday! Part of me wants to preserve that surprise, assuming it is a surprise I will be tickled with. The first quilt "Summer on the Beach" (the one that won a ribbon at MQX this year) I really don't think will do all that terrific. I'm not really looking forward to reading the judges comments because I know where it falls short. It was not quilted with the intention of going to a show. It was not pieced with the intention of being show-worthy. I never envisioned that it would actually be featured in not one, but two magazines this summer! It was sort of a whimsical decision the morning before I drove to Providence to go to MQX that I decided to enter it, and for it to be judged. It has some "just fudge it" piecing here and there. I've always been neurotic about my triangle points, but there's one row of 1" HST's that I decided really didn't matter that much! It's only destiny throughout the process of being made was to end up on my bed. And it will. The second quilt is one I have yet to show finished pictures of here. Call it a jinx. Call it whatever. You can even say that I am just like my mother, being slightly evasive by only showing you a picture of the quilt's back!! I designed this one from the start to be this year's show quilt. I second guessed each thing I did on it from the appliques to every patch of quilting. 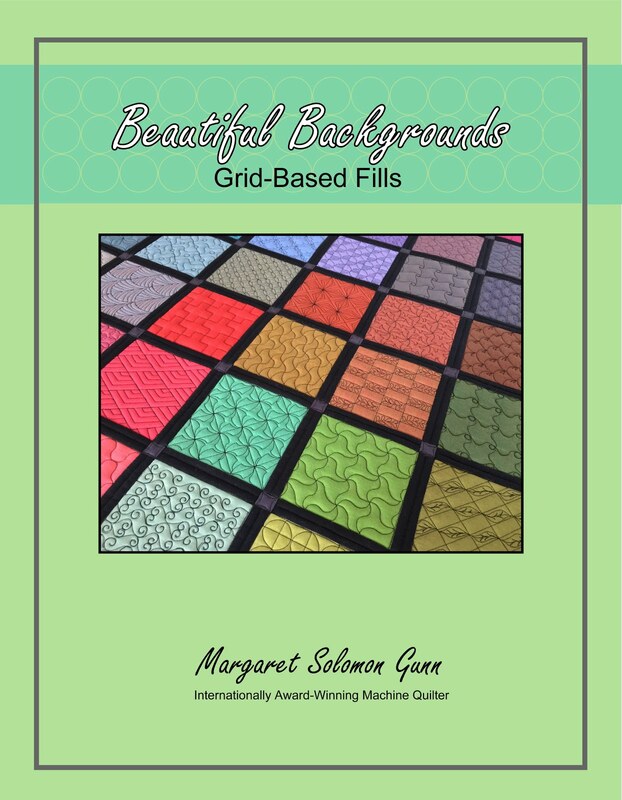 I solicited guidance from MQResource on my quilting plan. Now, I have posted this quilt there, and many very nice people have given me kind words of praise for the quilt. Click on that link if you feel compelled to see before Sunday. I look at it this way. I started the applique mid-Fall 2009. I'd stitch on them as may Thermo students took tests. In January of this year, I scrambled to get the relatively detailed (in terms of applique) corners finished. 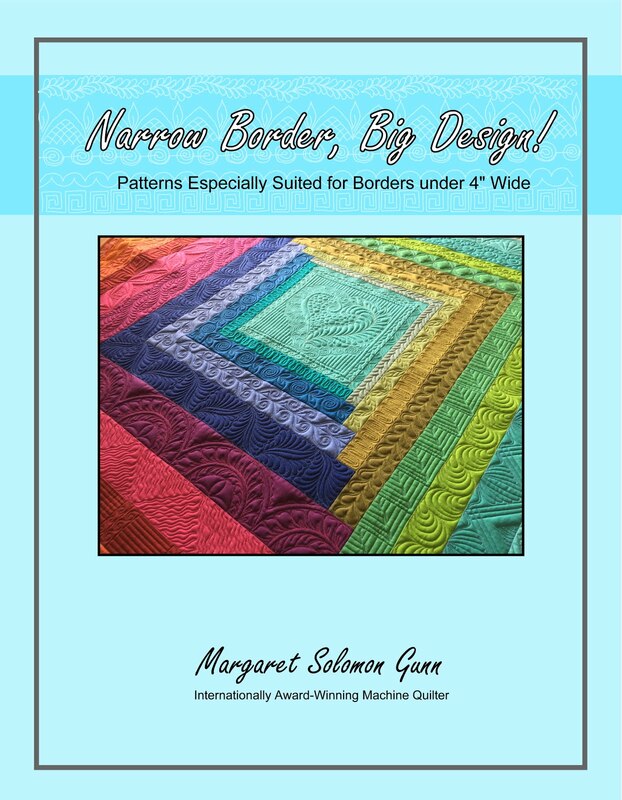 I know that I have been longarm quilting for 10 months. I'd only consider the last 5-6 months within the window of skills required to quilt this quilt appropriately. To get a ribbon of any color for my first year of machine quilting is an amazing feat. I am proud, as I should be. I'd be lying, however, if I said I am not greedy in the particular color ribbon that I really want! Greed. One of those so-called deadly sins. Or is it? Perhaps it is just the fuel that motivates each of us to be better at our trade. Here is a quilt I just finished quilting today. I have actually been within shooting's distance of finishing it for 2 days, but really was getting bored and found any number of excuses why I needed to to other things! It is now off the frame, and is getting all the quilter's marks removed (a big task for a dark blue quilt!). The client really loves this quilt and wanted it custom quilted. She showed me a picture of it done in a magazine, same fabrics and all. Thankfully, I talked her out of the disgusting microstippling on all of the ivory basket blocks. I just loathe excess stippling. It has no place as a filler on a custom quilt, when that is the primary detail quilting that will be seen. As you can see, all you really see is where the white areas are quilted. I chose to freehand feather where the magazine had stippled. It has so much more visual interest, and ties into the swirly-whirly feathering done on the outer border. Now, I know that if this were my quilt, I might have not chosen a backing fabric any better than this person did. Mind you, the quilt is lovely, and it is made from really nice blue fabrics (the ivory muslin is a choice I don't follow, but then). She selected the backing from exactly the same fabric as the border. It seems fairly logical, until you think about what that custom quilting might look like. On a piece with such stark contrast (ie., dark blue and white), I will use a bobbin that matches the top thread. I cannot bring myself to use blue and white together because that is just asking for a mess if even the slightest mistensions happen. This makes the blue quilting very neat, and the white quilting the same. As it should be. Now here's where the mess happens. The back is the busy, navy print. All the detailed white quilting shows as white on the quilt back. I have not had predictable success with monofilament threads and tensioning them so I didn't think seriously about using it . Maybe I should spend a few days playing. I really don't like the back whatsoever. IMHO...(and my opinion is rarely humble as you know) - this quilt would have looked infinitely better with a tan or rose or even sage green solid or very small print backing. The navy is really awful. Hopefully the owner won't be quite as offended as I am. The back was really pretty, and all of that texture would have shown so beautifully on a more solid (and lighter) backing. Live and learn. May you learn a thing or two by reading this blog about all of the goofs that we see in this quilting world! BTW, this client is a local person, not affiliated or aware of my blog. I wouldn't post opinions about your quilt that were derogatory if I knew you'd read them :-) I do try to educated quilting clients before they send/bring quilts to me if they do not yet have their backings, so this is purely a case of being too late to do anything differently. 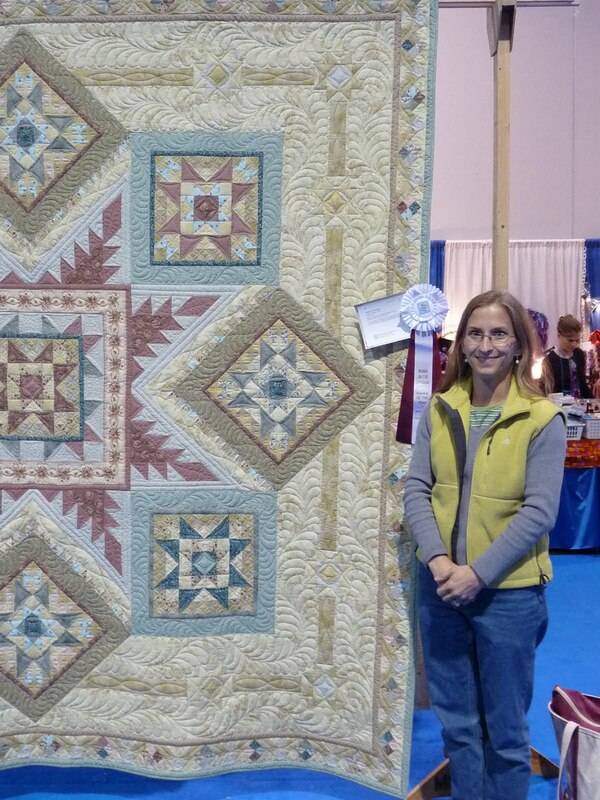 If you are in the Maine area, don't forget that the Maine Quilt show is this weekend! Or so I wish. I wish I had the mindset sometimes to just veg on the couch. Maybe have a bowl of ice cream and a beer and then take a nice 2 hour afternoon nap. No such luck here. Noisy kids and plenty of quilting in need of doing. Here's 2 pictures of quilts for Lisa that I did the day I got back from vacation, last Sunday. It's a great and simple pattern. It is not hard for a beginner, but it has a nice effect. I have it on my long list of patterns to make something with. Someday. The first one is quilted with a Jodi Beamish pantograph which I cannot remember the name of (and I am too lazy to go downstairs and look!) 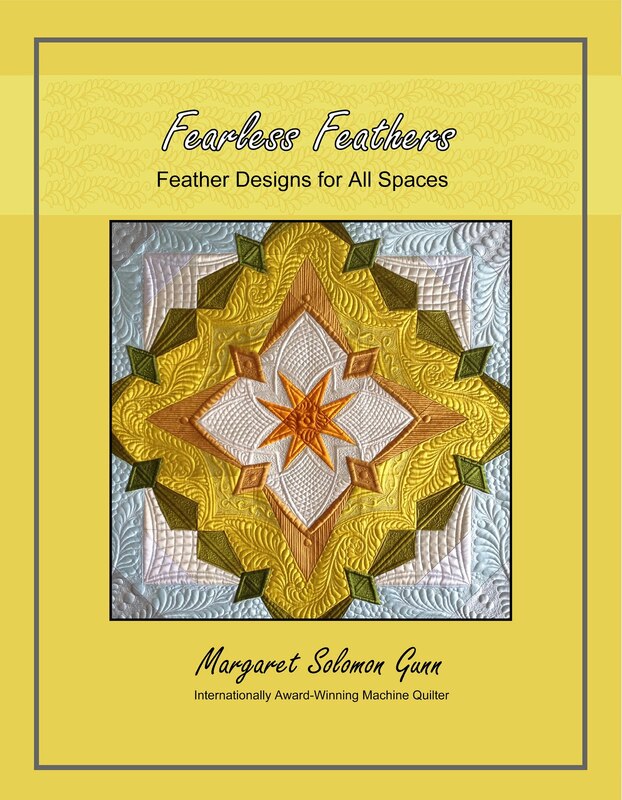 and the tan & blue sister quilt is a freehanded swirling pattern I call "feathers & swirls". Not so original there, but it usually quilts up looking nicely. I have done a couple other customer quilts this week too, ones that are on a very short list to be done for an August quilt show, and a baby shower next weekend. I'll show those next week. The baby quilt came to me Thursday and it's a customer that tipped me nicely recently when she had yet another rush job. On account of that, I had a hard time telling her I didn't reall have the time! I would have liked to have done more custom work on this quilt, but time really did not allow. Plus, I spent 2 hours friggin' frogging her quilt because I had of all things a nasty pleat about 12" long. I have never done this before on the backing so I was pretty steamed - my sewing space is warm enough right now. Last thing I needed was to be PO'd on top of that! Anywho, that quilt was finished up early this morning and looks fantastic. Somehow it is these ugly adventures in quilting that make me fully appreciate when a sewing spree does go really well. Like it did this afternoon. For the last couple weeks, I have been plugging through a bac of assorted scraps, cutting them into 2" strips and squares. Here's a few of the items I have pulled together. One is a 16"x40" table runner and the other two are between 18" and 20" square table toppers. These are some of my favorite fabric scraps - all brights and from a total hodge podge of designers. This afternoon, I loaded all three onto one backing fabric and quilted away. They are all done differently. My favorite is the one on the lower left. I suspect I will make a few more of these. Here's a runner I pieced and quilted earlier. It is the same fabrics, just larger pieces. This was a DP9, made from leftover 5" squares I had. These next two table runners were finished a week ago. I struggle to get a good photo of them. They are really pretty in actuality, but come across kind of dingy. The "Americana" fabrics are not really my taste, but it is one less charm pack sitting around my studio. Maybe someone will want to buy them. Fingers crossed (or else someone will undoubtedly get them for Christmas!). This morning, I brought my two quilts going to the Maine Quilt Show for dropoff. It always makes me nervous to leave my work or to mail it off somewhere. They were received exceptionally well by the quilt shop owner and the quilters that saw them. That is a good sign. Now it is in the hands of the judges. I have taken a number of pictures of the new quilt Primavera, and will show it after the show next week. 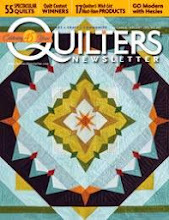 As another surprise, this 2nd magazine (The Quilter) featured several winning quilts from MQX, and on the last page was mine. That quilt is also on it's way to next week's Maine Quilt Show. I also signed up for an all-day class at the show. It's kind of late notice, but hey, what the heck. It is an applique class taught by Karen Kay Buckley. I do know how to applique, but I figured since I have to be there all day because of needing to pick up my quilts afterwards at 6-7pm, I might as well do a class! Have a fun week. Next week, my boys are again off at camp and I have a very custom quilt to tackle, and hopefully some desired piecing. I won't hold my breath there though!! 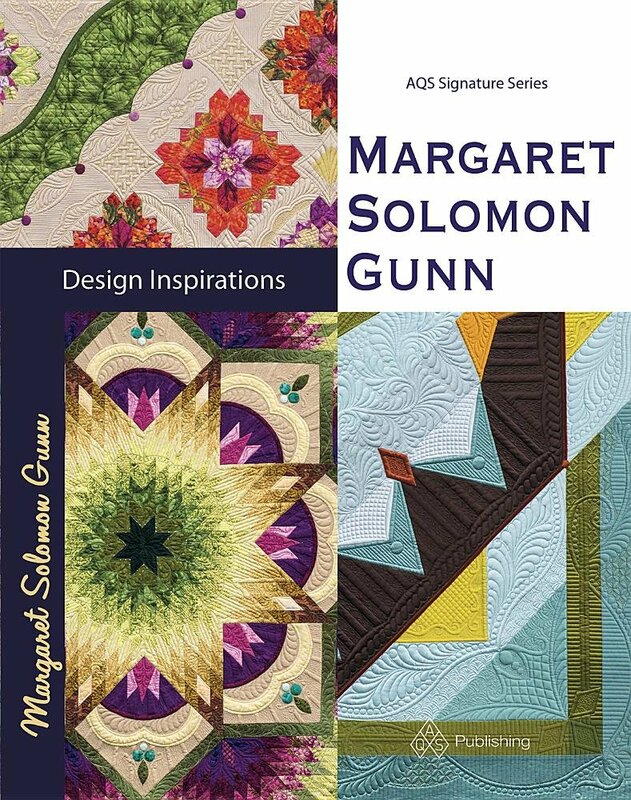 Before I left on vacation, I received notification that my MQX winning quilt was going to be part of a feature article in the September issue of The Quilter Magazine. 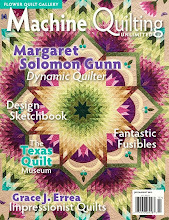 But today, my Machine Quilting Unlimited arrived. I was flipping through it while my boys were visiting the dentist. After 10 days in paradise, I am sadly, back to my real life. I cannot believe it has been 5 years since we have been here. There is just no place on earth like the Gulf coast of Florida. Fortunately for us, this is far enough south so that the predictions are only a 10% chance that the oil will reach these beaches. The currents in the gulf keep the oil away from these shores. It is Anna Maria Island, and it is my paradise. We started out with 3 days here. Disney. It is a monstrosity of a resort, and with less than a week to travel, we changed our lodging reservations so we could stay at the resort. Great move. Our place was awesome. We had several pools, transportation to the parks and dining, etc. And a coach pick up from the airport. Cannot thank the source that tipped me off to staying at the resort rather than any other hotel nearby. Well worth the extra cost. My kids loved Disney, all the fun rides, etc. I am most surprised how all of them glommed onto the characters whenever we saw them too. My daughter stood in line 45 minutes (longest line of all events) to see 3 princesses. It was so totally worth it to see her face. A-M-A-Z-I-N-G! We did a day at the Animal Kingdom park too, which I really liked. Then a week at the beach. I highly recommend the Disney part first and the beach second. I love the beach and the sun and surf. We had a house with pool that was 5 houses from the beach. PERFECT. The kids swam in the afternoon and played at the beach in the mornings. The surf was just calm enough all but one day to float with a tube/noodle. The kids and I searched for shells, and those few elusive sand dollars. On our last day, we even saw 2 manatees swimming in the wild (on the ocean side) and got to witness a very friendly pelican from 2-3 feet. He was as curious about us as we were about him. The Sarasota Jungle Gardens was a nice park for the kids, with many indiginous Floridian animals from gators to fancy birds to these lovely and friendly creatures. We got to feed them from our hands like you would a duck. The boys held a baby croc too. I have been puttering the last couple days before I leave for vacation. My kids are more than psyched about going here and here, and about having a house with a pool 3 houses away from the beach. Gotta say, I am pretty excited too. I just hope that the weather and the potential hurricane out there stay away. We made a very last minute change last week and decided to stay at the Disney resort rather than a few miles further away at a cheaper hotel. The convenience and allure of the resort was overpowering. It's also pretty neat that we have a riverboat as our main means of transportation to the village! The last few days I have been playing in a pack of charm squares (right) that were given to me last year in a swap. They are kind of too "Americana" for my taste, too much muddy colors and browns. So, I made up a couple of runners that I hope to sell this fall. Same thing for the other two brighter runners. I had many left over 5" squares from another project I did last fall. 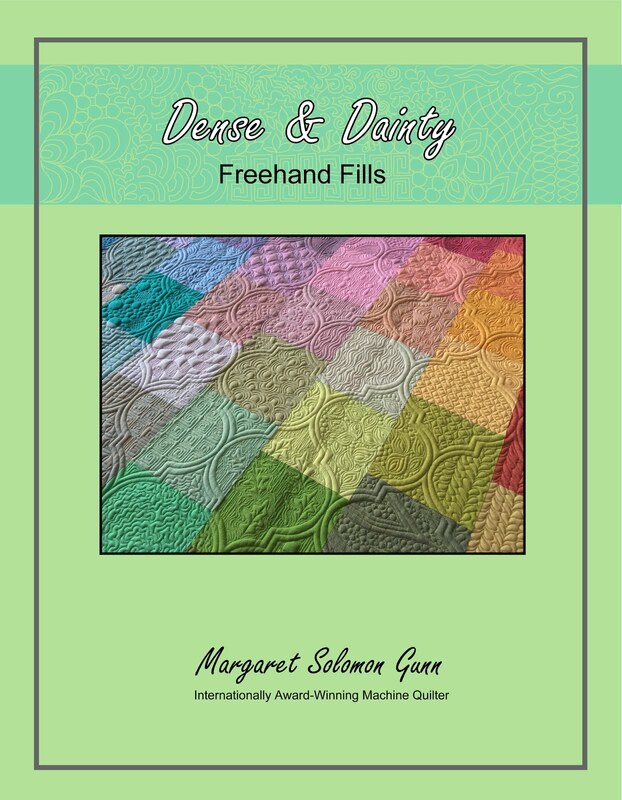 The DP9 is a fun pattern to mix many fabrics together with. They will be quick quilt projects when I return, especially if I think ahead and connect all of the backings (one backing load for all 4 runners). I have another smaller table topper in progress, but it will have to wait. I also got these squares put together earlier last week. This fabric is SO soft and pretty (I'll have to check the selvage for who made it again). The colors are a departure from my usual brightness, but it is very delicate all stitched. So I am off for 12 days. Don't miss me. I'll be off getting rested and tanned, and rejuvinated to quilt a marathon (I have a TON of pieces to complete when I return!). This post is all about F things. My mind is a tad twisted today. Frantic, fried, and thankfully, it is Friday. It's been a hectic week, despite having my boys off at day camp all week. I have had a multitude of appointments for my daughter, and way too much running around and driving places. I have turned into a shuttle service. I guess that's every mother's plight. I took my almost four-year old (and her Nana) to the swimming pool for the 2nd time this week. She's like a total fish, that one. So totally at home in the water, kicking around and dogpaddling. She'll be without the bubble belt by the time our 2 weeks in FL are done. Then we got a free lunch at Friendly's (the "happy ice cream place", as Miss S calls it) - not much better than that. We are in for a wonderful weekend here, upper 80's/90's and I for one cannot wait. We are heading to a lake for the Fourth, and all are excited about trying out their newly learned swimming skills (my younger ones that is). Maybe we'll even stay for the fireworks this year too since my husband does not work the next day. And for friendly faces, flowers and five. Yes, five. That's five days until I fly to Florida. Did I say FIVE??? Here's my sweet (and very bright) friendly face in front of some flowers. My gardens got a well needed snip & clip yesterday. There were TONS of heads to dead head. I started it a week ago and mistakenly chopped through my finger. The clippers are new, and very sharp, and hurt like bloody hell. I didn't dare touch the clippers for 6 days! Here's a client's Sun Flowers quilt completed recently. Not the best Foto here, but the next one shows better detail. It was fun to quilt. I got to use some of my orange thread - actually an orange-yellow variagated Rainbows, though that is not evident here. I pebbled the flower centers and the brown border, to carry that type of quilting throughout the quilt. I actually picked out 1/2 of the border pebbling and redid it (only after saying LOTS of foul words, mostly starting with F). Frustration... But in the end, I like the finished quilt. And, though, this does not start with F, it is for the same client so I thought I'd put it here for giggles. It's a sweet small wall hanging of hearts. I got to play with pretty background fillers. And a few shots from my flowers. The gardens are full of blooms right now. Lillies, Daisies, purple coneflower, gaillardia and more. So there's my take on "F". Fun, flowery, fantastic, fourth and not to be forgotten FIVE! !